The Learning Commons at the University of Portland has made strides in professionalizing our tutors through training. Our syllabus includes 11 hours of live face-to-face training modules. In our training, trainees learn how the tutoring cycle provides structure for our tutoring sessions. As a faculty member, I’ve also adapted the tutoring cycle as a strategy for helping students during office hours. 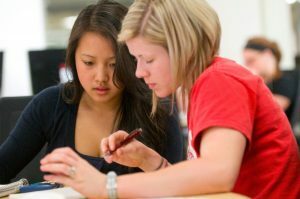 Greeting and setting expectations: In the peer tutoring session, it’s important that the tutor let the student know that she or he can expect to work at the whiteboard or think aloud while working with material. We train our tutors to state their roles in a first session with a student and to remind students of their expectations in subsequent meetings. Assessing the student’s needs and identifying tasks: While a student may say, “I want to work on my homework,” it’s important for the tutor to identify more precisely what the student is struggling with and what their goals are for the course. The former can be done by asking more probing questions or even having the student show how they’ve approached a specific homework problem or prompt. Drafting with the student a specific agenda for the session by using a checklist on the whiteboard (or on paper) is a handy way of making the tasks visible. Recommending and demonstrating strategies: Our peer tutors usually have strategies that they can share with students. These can range from reviewing concepts or processes in their notes or the book to specific approaches or rules of thumb to use when working on a problem or task. Formative assessment: Having students practice problems or tasks and apply demonstrated strategies offers the tutor and student the opportunity assess progress. We train tutors to give implicit feedback through questions and other means of highlighting student thinking and misconceptions. 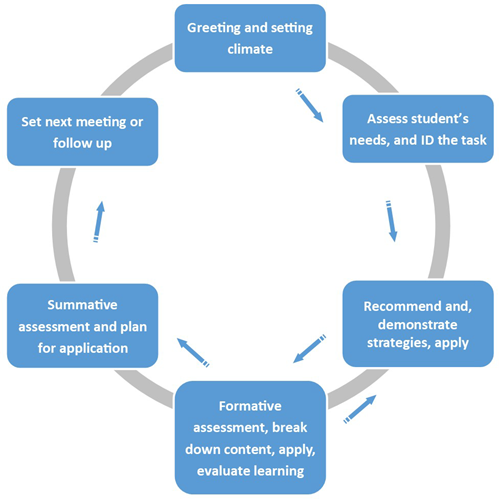 Notice that from the diagram that tutors can shuttle back and forth between formative assessment (practice) and demonstrating strategies. Summative assessment and planning for learning: Every session needs to end with some sort of summative assessment. This can be a final problem or prompt, or the tutor may direct the student to teach the material on the agenda or checklist back to the tutor. When in a rush, the tutor can have the student list three takeaways, two ways he or she will use the takeaways, and one question about the material that the student wants to pursue in the coming week, also called a 3-2-1 assessment technique. The tutor also works with the student to sketch out a plan for learning for the next week. Setting up a follow-up meeting: If needed or desired, the tutor invites the student to set up another time to meet. How might this work in an office hour interaction? Letting students know that they will be actively thinking and working when you ask the student questions and direct them to elaborate on something or work at a whiteboard (or on paper). Taking time to dig deeper into what the student knows and doesn’t know can help you and the student to plan the office hour visit. You can separate between what is needed and what might be nice to know and then focus on the needs. Asking questions and having the student do some work will reveal areas needing your attention. Once you know the students needs, you can share strategies for working with the material, ways of conceiving of it, or even methods for keeping track of learning (e.g., effective note-taking strategies that you’ve learned over the years). Allowing time for the student to practice with the material gives you time to assess her or his progress. A simple teach-back or 3-2-1 technique offers you a sense of how effective the office hour interaction was. The invitation to return or to ask questions in class can help the student to feel a sense of belonging and added motivation to participate in your class. As you practice these steps, you will learn ways to vary them and apply them to groups during office hours. Faculty office hours needn’t be about students coming in to be retaught the material. We can instead apply tools like the tutoring cycle and other student engagement approaches to support active learning, metacognition, and higher order thinking. Jeffrey White is an instructor of German and directs Learning Commons in Buckley Center 163. For more information on the Learning Commons’ certified tutor training program, contact Jeffrey at white@up.edu or (503) 943-7141. The Learning Commons is a program of the Shepard Academic Resource Center and offers trained peer support in writing papers, math, foreign language learning, biology, chemistry, physics, managing group projects, speeches and presentations, along with hosting tutoring for several nursing courses and business courses. Before we initiated tutor training in our programs in the Learning Commons, it was common for peer assistants to do more explaining and less asking. Nowadays, questions increasingly play a major role in our peer assistance sessions. While our trained peer assistants may know by heart that the role of the tutor is to facilitate students’ development of active and self-regulated learning in a higher education setting, making the shift to deploying more questions takes time, observations, and debriefing. Our peer assistants are learning more than ever through their experience and training that inquiry can uncover the ways students think and the gaps in student learning. Paraphrase what you heard the issues to be. Now have the student paraphrase the highlights of the whole session. We can naturally substitute questions that fit the context at hand and one is not bound to this exact sequence. The key is to use questions that move through elements of Bloom’s Taxonomy (from identifying and explaining to applying, analyzing, and making connections to other concepts). Sometimes students struggle to answer initial questions, but even here, we can use questions to direct students to resources (“Where in your book or notes might you find this out?”) and to support methods of retaining and recalling information (“What methods might you use to remember these concepts?”). The 6PQ Method for Discovery Learning falls under the rubric of critical thinking approaches in teaching and tutoring alongside, for example, Socratic questioning. In our many interactions with students, whether in class or during office hours, we can intentionally use a variety of questions to further cognitive processing, learning, and critical thinking. As we move from explaining to questioning, we let students make their thinking visible to us, and from there, the deeper learning can truly begin. Jeffrey White is an instructor of German and the Learning Commons administrator in Buckley Center 163. He can be contacted at white@up.edu. The Learning Commons’ peer assistance programs not only support students; they can support faculty by increasing student awareness of learning processes involved in mastering course material. More genuine questions during discussions and during office hours. A greater sense among your students of belonging to a community of academic. Recommend that your students use the Learning Commons early and often as a habit of mind. Invite students who have benefited from using the Learning Commons to explain how the experience supported their learning. By taking such steps in your class, you will also gain the satisfaction of knowing how you are supporting students’ active efforts to learn more outside the classroom for your course. Requiring that all of your students use a specific program for the same assignment. This can overload the system, as we have only so many peer assistants. Requiring visits should be used judiciously. Equating peer assistants with TA’s. The role of the peer assistant is to support the development of active and self-regulated learners. Our peer assistants are trained not to teach the material beyond the selective use of explanations. They will use questions and seek to have students use resources from classes (books, notes, Moodle page, etc.) to learn the material. The vision of the Learning Commons is one of an evolving community of active learners at UP. To help fulfill our vision, the Learning Commons has initiated 11.5 hours of general tutor training of all peer assistants who work for us. This is on top of the content-related training that peer assistants receive from their discipline-specific coordinators. We are also applying to be able to certify our peer assistants through the College Reading and Learning Association’s International Tutor Training Program Certification process. We are piloting our Level 1 training this year. Our goal is to certify all of our peer assistants in the Learning Commons and to provide training and certification for peer tutors who work in various departments and schools within UP. I invite you to learn more about how the Learning Commons can support your students by contacting me at white@up.edu or (503) 943-7141 to arrange a time to discuss how best to make the Learning Commons work for you and your students. The Learning Commons’ trained peer assistants can also come to your classes to present how the Learning Commons can support your students’ learning. Many thanks go to our discipline-specific coordinators and collaborative partners: Dr. Cara Hersh (Writing Center), Dr. Carolyn James (Math Resource Center), Dr. Dan Foster (Speech and Presentation Lab), Dr. Vail Fletcher (Group Work Lab), and faculty and staff in Biology, Chemistry, Physics, the Pamplin School of Business, the School of Nursing, and the Shiley School of Engineering. Jeffrey White, M.A., M.S., is the program administrator of the Learning Commons within the Shepard Academic Resource Center, and he teaches third-year German, Maximizing Study Abroad, and training courses for interning foreign language peer assistants in the Department of International Languages and Cultures.